Image | This entry was posted in Events and tagged Acocks Green, Autumn Fair, Bouncy Castle, home made gifts, St Marys Church. Bookmark the permalink. 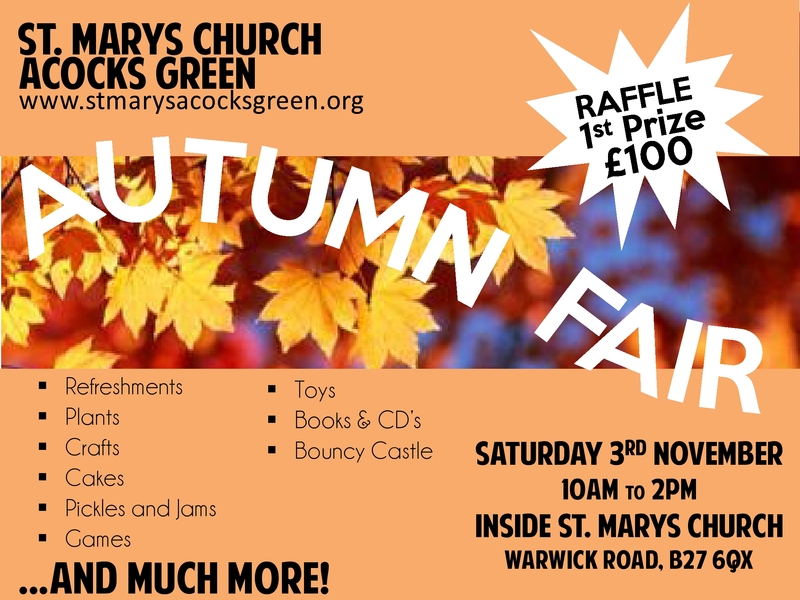 In the 8 years that I have lived in Acocks Green, it is first time that I went for the ‘Autumn fair’ at St. Mary’s. I must say that my family and I thoroughly enjoyed it and will definitely go there next year.It was nice to see a bit of community spirit. Well done to the organisers. Thanks for your comment. Nice to read such positive feedback. Darn I missed it was hoping for a xmas fayre been to a few now and I love the pickled onions (when you can get) I also buy home made marmalade, jam,and fruit pie and cakes all home made. The cafe is lovely but gets very busy all food great! Mixture of tombolas, jewellery, toys, christmas cards and home made chocs.